Wake up with so much excitement - so much to explore in a new city. Breakfast again on the street corner under umbrellas - the typical misting sprinklers providing a lovely coolness in this dry heat. It's Saturday morning and almost every person is walking with their granny trolley (as i would usually be to the kuraby markets) and we follow the locals and explore their food markets. Separate fish, cheese meats olives fruits and vegetable sold by vendors taking pride in their produce. I could shop here easily with this inspiration surrounding me. We taxi to the gardens and cable car over the enormous city parks, somewhat plain river and distinct european housing. It's a distinct profile an European town's horizon with spires and turrets and statuses against the sky. We walk back, Joels directing our way with his fabulous map app ensuring we don't miss a garden or fountain or statute. Finally to the food markets we found yesterday where you push your way into one of many tiny stalls and choose food and drink, tapas (snacks) freshly shucked oysters here, cheeses, meats. Pastries, wines, beers coffees oh the amazing joys of deciding on such deliciousness. 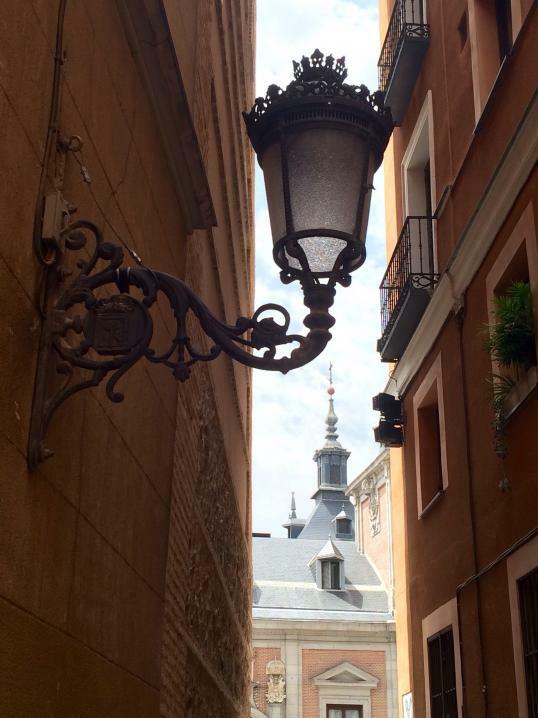 Then we walked the old streets, narrow shaded laneways of the ancient quarters of the city. And wondered about the history of this place.